I'm not sure what you really need to do with that espresso shot. It might resemble adding. Thanks, Jeff. 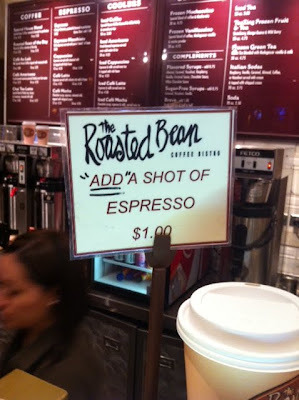 I imagine people were ordering shots of espresso for a dollar, so someone wanted to make it clear that the price was only for an added shot to another drink. If only they had stopped with the underlines. Or you could just act all hyper, and pretend you added a shot of espresso. Or, give us a dollar and we'll say we did.